Over the last 15 years, we’ve served the best drinks, delivered the most creative productions and are proud to have worked with the cream of the UK’s best event music festivals, sports events and concerts. From Barclaycard British Summer Time, to Carfest, The Commonwealth Games to the Rugby World Cup – we love working with amazing events and visionary promoters alike. Having spent the last 15 years working with the UK’s best event organisers and drinks brands, we have unrivalled experience in high-performance retail-led bar services. We offer a full spectrum of event solutions, looking after every aspect of F & B delivery. From the build and production, to staffing and menu creation, let us take care of it. 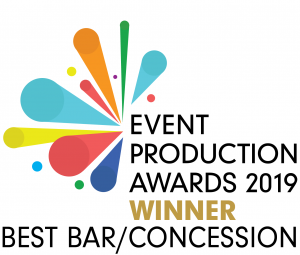 If you need an experienced, intuitive and award-winning festival bar provider for your festival, look no further. We can bring you unique and unrivalled product choice, bespoke design, brand support and expert bar production. During the festival, we can guarantee your customers the quickest and easiest service. We are run 100% on EPOS and accept card payments at all of our events, including Contactless & Apple Pay. Our unique real time reporting tools also allow us to deliver tangible value by using real time insights to respond to patterns and trends, ensuring the taps never run dry. Every year we deliver event solutions to the best British event and festivals, such as British Summer Time Hyde Park, All Points East, Carfest, Henley Regatta and many, many more.